Pile on in gang, because this week we have another little game for you. 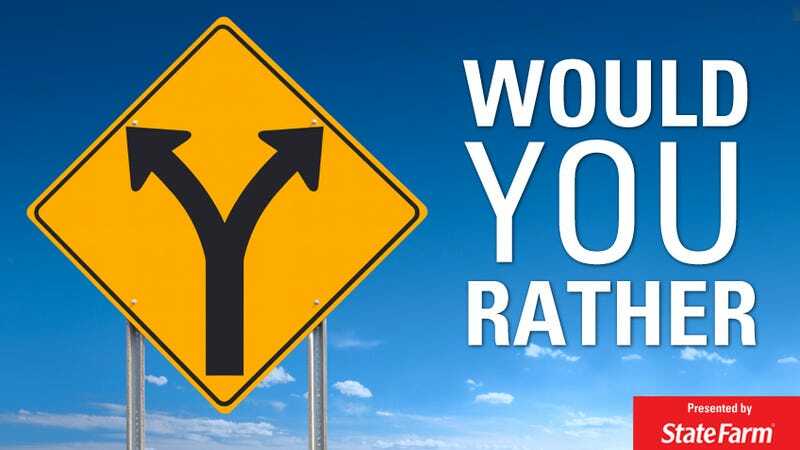 Playing is easy, but the stakes are high, so welcome to another round of Would You Rather—brought to you by the folks at State Farm. Remember the good ol' days of being snuggled up in your pillow fort with a "Choose Your Own Adventure" book gripped tightly between your fingers, thinking to yourself, "Holy cr@p! I can't believe I was dumb enough to pick swimming with piranhas on page 42! Being a grownup is going to be so awesome/scary!" Well, like it or not, that time has come. And it turns out that making big kid choices isn't always as easy as deciding if you'd rather traverse a river or climb a volcano. So in hopes of adding a little fun to the process of making real-life decisions, let's get started, shall we? 1. Go to Spring Break in Cabo? WOoOOoooo! 2. Break the video camera you brought along for "very important anthropological research?"